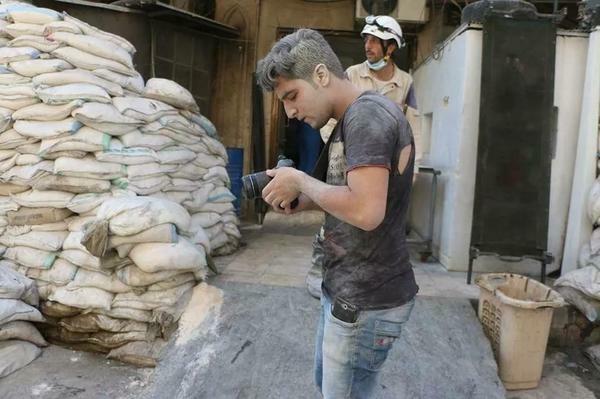 Khaleed Khateeb, 21, was the videographer for the Netflix documentary The White Helmets. "This photo was after double tap of aircraft on July 27, 2014," he says, referring to an airstrike followed by another attack. "I don't know how I survived." "I never thought I can make a film for Oscar!" says Khaleed Khateeb. Khateeb is a volunteer for the Syria Civil Defense forces, rescuing those caught in the crossfire of the civil war. He began filming scenes of the rescue missions and posting them on YouTube. When filmmaker Orlando von Einsiedel decided to make a documentary about the group, he got in touch with Khateeb, gave him training and better camera equipment and told him to keep on filming. Today, it was announced that the 41-minute Netflix film, which features Khateeb's footage, has been nominated for an Oscar in the short documentary category. "I feel we let all the people around the world ... know what is going on in Syria," he told us after hearing of the nomination. We spoke to Khateeb last September about his work on the film and we interviewed von Einsiedel as well. That story is below.